[Nova Gorica, 20 November 2018] – Today Enkronos finalized its ICO with a great success. 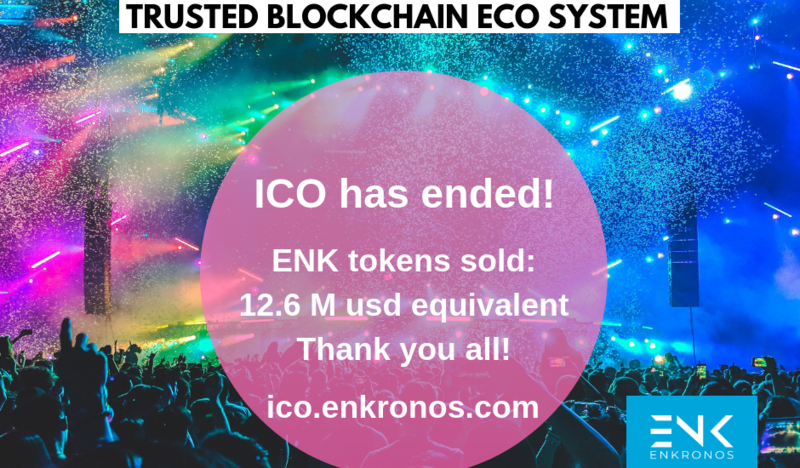 After reaching soft cap in the first week of private sale, on public sale Enkronos sold tokens for 12.6 million USD equivalent among digital assets and fiat money. This is not a lucky case: it is simply the natural result of hard work conducted by an extraordinary and high skilled Team that had vision and the strength to achieve a goal that when we started could seemed something crazy and that now is becoming reality. Enkronos secret is that our solutions are already used on a daily basis by our Clients. This result has been possible also thanks of the important contribution of local entrepreneurs clubs and business communities, especially from Veneto (Venice Region) and northern Italy with which Enkronos established a deal. Our ICO is a great result that gives Enkronos the strength to go on in the realization of its project and it confirms that Enkronos ICO is not the usual ICO. We started planning our project three years ago and before proposing us to the cryptoworld, we already had a digital platform developed with many applications ready for business and many others that are going to be soon available. That is Enkronos Apps, a powerful multi-application ecosystem for advertising solutions, marketing and promotions, gamification, artificial intelligence, augmented reality, internet of things, big data and e-democracy, just to name a few areas. “Enkronos Apps” is based on a Blockchain-based accountability system that ensures ethical behavior, complete protection of personal data and privacy and then it is the solution to great often unsolved problems and unanswered questions such as: 1. Lack of respect of ethical conduct in data driven projects; 2. Lack of protection of personal data and privacy; 3. Platform and app development high cost and low financial efficiency. “Enkronos Apps” creates value to the ecosystem since it enables quick publishing of complex and heterogeneous data driven solutions, it solves different problems (such as the mentioned ones), it reduces the required time and skills to realize complex data driven campaigns and projects. After its ICO, in some weeks Enkronos Tokens are going to be listed on some important exchanges, in the most suitable moment of the market in order to give ENK token the most appropriate value. We’ll disclose information about that very soon. 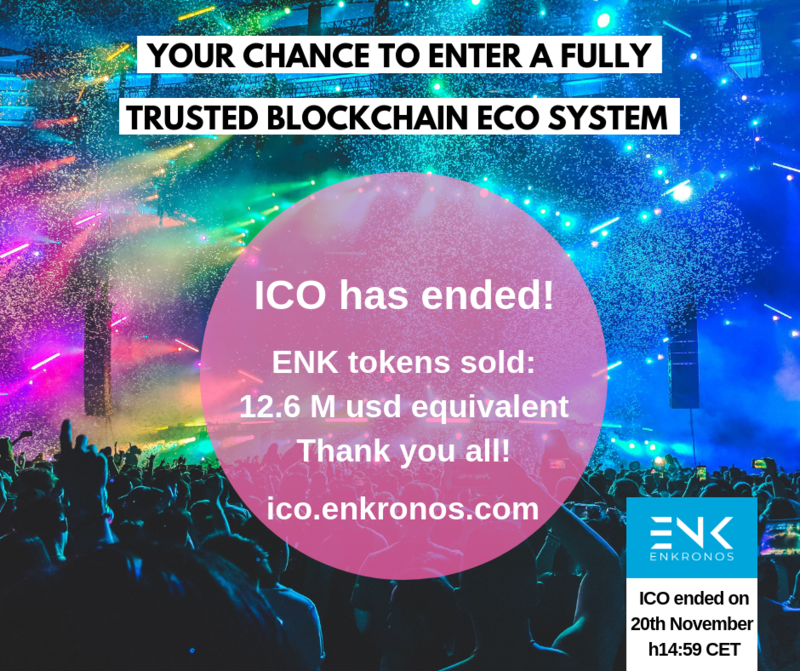 In the meantime it is still possible to buy ENK tokens at the fixed ICO price (1 ENK = 0.003 ETH) directly from the website ico.enkronos.com.